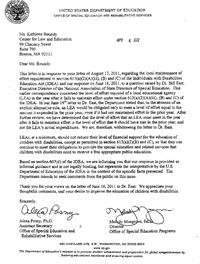 Today the U.S. Department of Education (USED) issued a letter to the Center for Law and Education (CLE) regarding the local maintenance of effort requirement of the Individuals with Disabilities Education Act. In the letter, USED informs CLE that it is withdrawing its Letter to East of June 16, 2011. IDEA Money Watch first reported on this issue back in August of 2011. The Center for Law and Education – our legal collaborator – issued a response to the Letter to East, explaining why the USED interpretation was inaccurate. Following that, parents and advocates across the nation went to work – sending letters to both USED and members of Congress asking for a re-examination of the legal interpretation put forward in Letter to East. We are overjoyed that those efforts paid off. Thanks to everyone who worked hard to make this happen! This entry was posted on Wednesday, April 4th, 2012 at 11:25 am	and is filed under Balance Sheet. You can follow any responses to this entry through the RSS 2.0 feed. You can leave a response, or trackback from your own site. Thank You for following through with this Legal event! our children will thank you.